The Palio of the Assumption took place on the 16th of August in Siena’s Piazza del Campo as it does every year, but this particular edition truly showed its ancient, exciting roots more so than past races. It all began with the traditional Sienese way of sorting out who had the best chances of winning and this race saw a serious factor to be considered: “4 greens” would be racing on the piazza that day (contrade with green in their flags) and this is believed to be a portent of something unpleasant to come. To start off, the weather was so unpleasant that it impeded not one but two trial runs. This also made it necessary to lay down another layer of tuff on the piazza almost as the drums were starting to beat. Thankfully, the historical procession that preceded the race was beautiful and everyone then turned their attention to the start of the race. 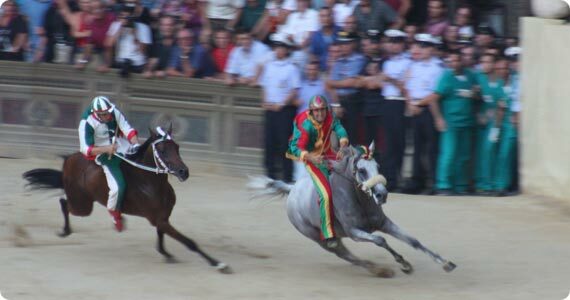 For anyone who has not witnessed a Palio before, you should know that more or less there is a time when all the horses should be ready to start but that the start of the real race is not set. A large hemp rope marks the start line, and here is where the horses start to line up and only once they are in a particular, predetermined position is there a possibility for the race to begin. Luck, the real and undisputed director of this race, sent three sets of long-standing rivals to the rope: Nicchio/Montone (shell/ram), Aquila/Pantera (eagle/panther), and, in particular, that of Oca/Torre (goose/tower). The lottery that assigned the horses was rather homogeneous, with various expert and victorious horses. Drago (dragon), Tartaruca (tortoise), Torre and Oca got the favored horses. When Scompiglio, the horse jockey for Drago, finally “flanks” his horse to take the lead, the Oca takes advantage to both slow down Torre and surge in front of it; at the head of the race thus we found Drago with his excellent horse who unfortunately slips at the Casato, loses his jockey and in the crash blocks the recovery of the Torre who from then on finds itself obstructed by the “shaken” horse that continues to run on its own. At the lead, the Oca seems to have a clear road ahead. At this point there is desperation in its purest form in the contrada of the Torre: not only does victory seem to slip through its fingers, but in the lead is its worst enemy. And as one knows, in Siena it is important to win the race but it is almost as important that the contrada’s worst enemy contrada not win as well. The unthinkable then happens: the Bruco (caterpillar! ), with a horse and jockey known as Gingillo, or “knick-knack”, neither of which have won a race before, starts to slowly gain on all the horses ahead of it, and in the last possible moment and with a great surge of strength, passes the Oca and wins the race! All predictions by English bookmakers on the eve of the race go out the window, let’s hope they’ve learned their lesson. Incredible party by the “brucaioli”, a victory rendered even more spectacular since unexpected, and thus maybe a bit less expensive than it otherwise might have been. The sky above Siena is clear but not just because of the wind; even if there had been a few clouds, the enormous breath of relief the “torraioli” gave out would have sent them on their way. The Bruco won and thus off we go to unfold the flags and join in the celebration of the allied contrada and the narrow escape from danger. On a blog dedicated to the Palio there was a post that naively asks whether “the best one won”. Maybe it’s a side effect of the Olympics, but in this medieval joust there is neither the best nor the worst, there is only a winner and a loser. In Siena, in particular, the real loser is the one that almost touched victory but who saw it slip out of its fingers in the beat of a few seconds… and ends up being mocked. (The photo above shows the Drago and Oca right before the Drago horse slipped and lost his jockey). Vacationing in Tuscany? In a summer of bans, beware the fines!